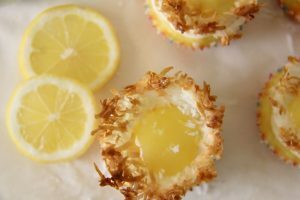 These lemon coconut nest cupcakes are a delicious batch of lemon cupcakes with a coconut nest on top. A great low carb and gluten free cupcake for Easter and spring. These are not your everyday, whip up a batch of cupcakes. There is a two-step process to make this dish then putting it all together in a glorious tower of lemon and coconut deliciousness. It’s a two for one treat of a cupcake. I was making a jar of low carb lemon curd and although I had most it aside for another dish, I wanted to use some in a lemon curd cupcake. 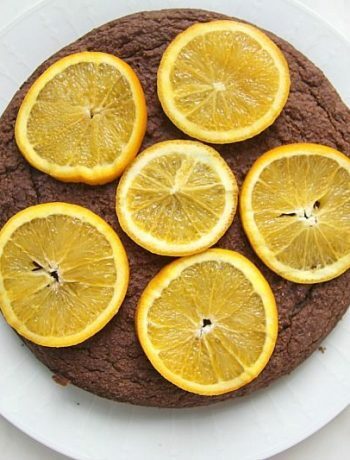 There is nothing like the flavour of lemon for a spring time tasty treat. Since I had been looking at making a coconut nest for Easter, I thought that I would combine the two. 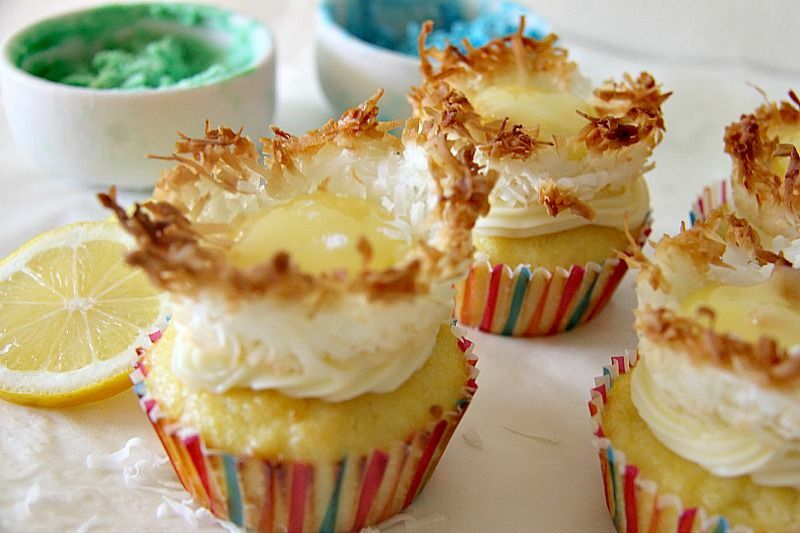 I had thought about decorating these lemon coconut cupcakes with mini eggs within the coconut nests. As I don’t have a mini egg chocolate mould and am not going to use sugar laded chocolate eggs on my low carb lemon cupcakes that was a no. I toyed with the idea of making fat bomb eggs for the decoration. I should have left that just as a thought as I wasted an hour of my life that I would not get back again and made a lovely mess in doing so too. They were a disaster and melted in my hands as I tried to shape them. I used food colouring too which I was not happy about. In the end the dishes of the mixture made for a nice colourful backdrop in the photos. They did not taste very tempting only. 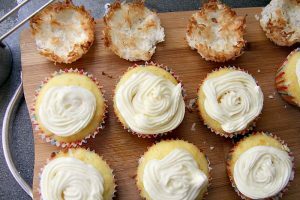 I was happy with the final result of the lemon coconut cupcakes as the lemon curd centre in the middle of the coconut nests looked like egg yolks so that was my Easter contribution! They would be great for an afternoon tea and a pretty centrepiece. 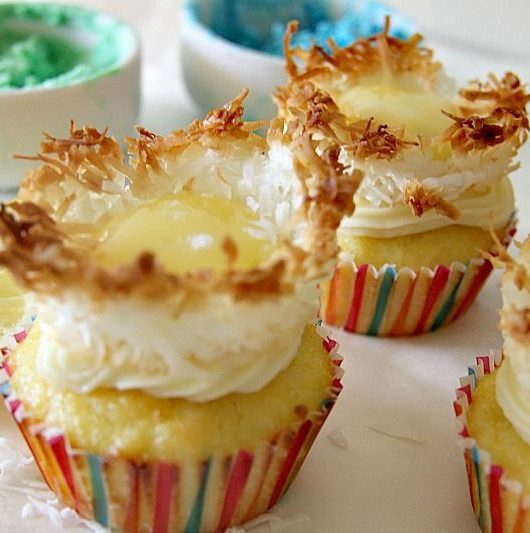 The Chief Taster wanted them separated between the lemon cupcake and the coconut nest. I scoffed and told him it’s a man’s tower of a cupcake. An Easter treat to be climbed and conquered. Or simply pulled apart and eaten in the two sections. Whilst holding out your little finger in the feint attempt to be dainty. 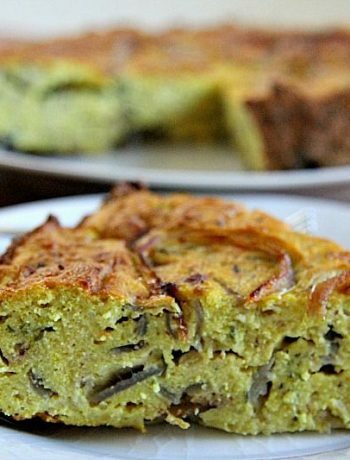 Add the coconut flour, baking powder and salt, and whisk until there are no lumps and there is a smooth batter. In a bowl, mix the coconut, erythritol and egg white together. 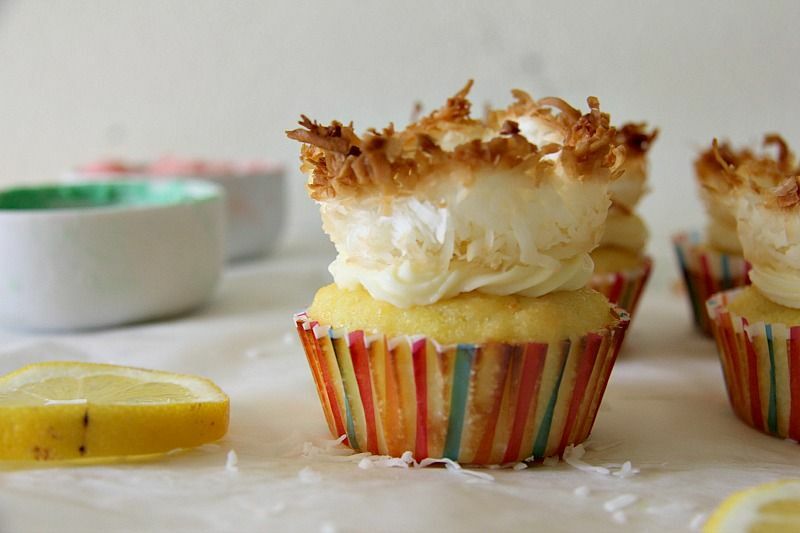 Press about a tablespoon of the coconut mixture into the cupcake liner and mould into a nest shape. 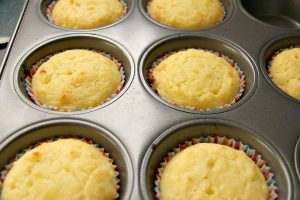 Once cool, gently remove from the cupcake liners. Mix the Mascarpone cheese with the 3 tablespoons of lemon curd until combined. 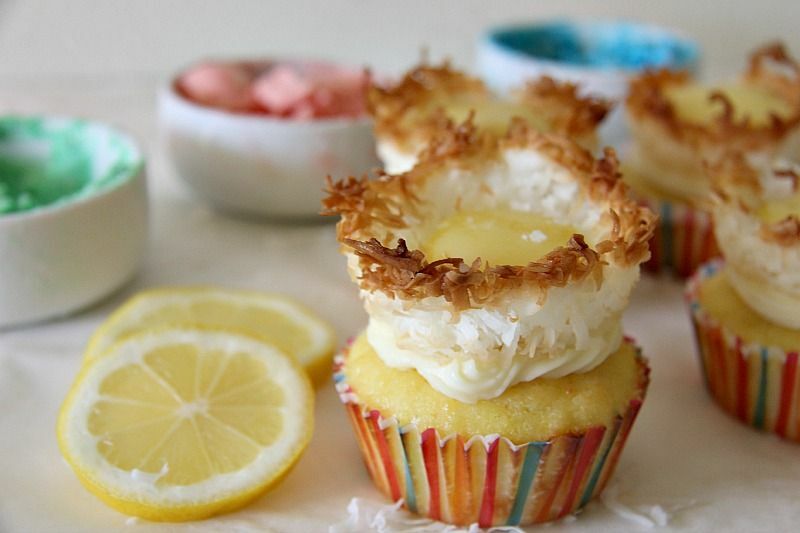 Pipe or spoon the mixture on top of the lemon cupcakes. 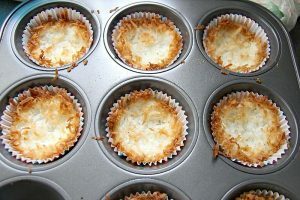 Place the coconut nests on top of the cream topping and gently push to place. 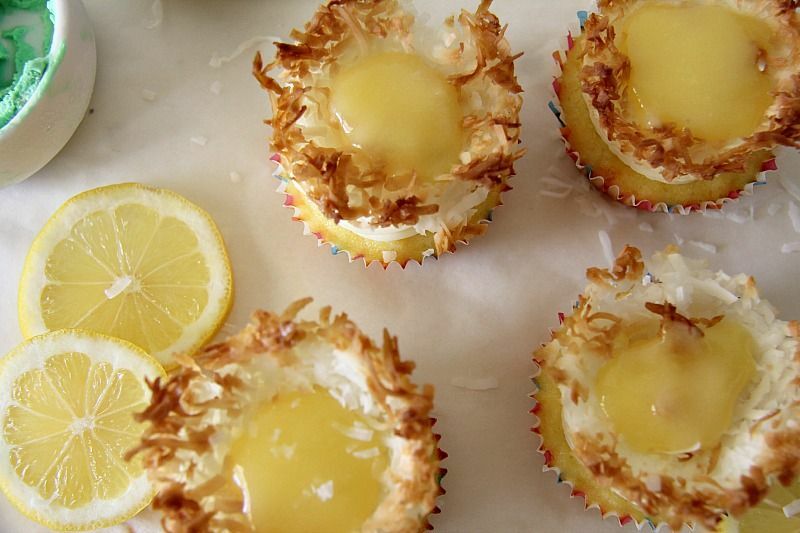 Spoon about a teaspoon of the lemon curd in the centre of the coconut nests.